Click the button below to add the Innomax Single Chamber AirBed to your wish list. These airbeds are designed to fit hardside waterbed frames. Replace your waterbed with a sleep-on-air air bed and save the expense of replacing your entire waterbed frame. Most hardside waterbeds are sized differently than traditional mattresses. These airbeds are designed to fit non-standard waterbed sizes. Now you can save yourself the expense of replacing your attractive hardside waterbed frame by simply replacing your old waterbed mattress with a new (and affordable) airbed mattress. Discover the Sanctuary Air Mattress and learn why 35 years of sleep-crafting experience makes all the difference in how well and affordable air mattress can help you sleep. The features built into the Sanstuary Air Bed are second to none. The inner support system of the waterbed-airbed is achieved by a unique electronic welding technique that connects weld running the length of the airbed. This UNI-Body construction helps minimize lateral sway and the See-Saw effect that is common in so many arimattresses. It also helps maintain a uniform PULL between the top and bottom surfaces resulting in a flatter sleeping surface for improved posture. Crafted for quality with heavy gauge vinyl that is durable and easy to maintain. Quality tested 20 gauge vinyl beams and bottom. The airbed comes with a quick deflating free-flow deflation plug. 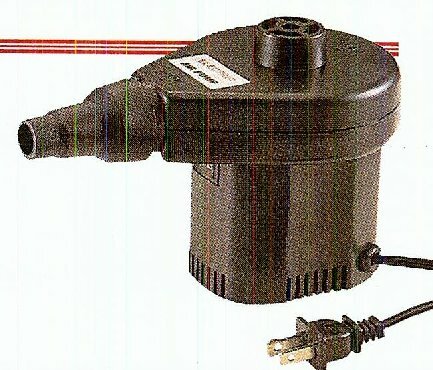 Add a hand-held blower air pump to make inflating or topping off your airbed as easy as can be. The convenient hand-held pump comes with 3 adapters to fit (nearly) all large-volume inflatables.